Have you tried following exercise? Starting with your own name, try Googling various phrases and find out those phrases which show up your name or articles in the first page of results. Last week I spent some time doing this exercise and I found following phrases: “what is technical leadership”, “types of technical leaders”, “technical leadership ecosystem”, “technology captives”, “prototyping competency”, “black swan innovation”. When I mentioned this to my wife, her immediate reaction was, “You are jobless!” Agreed. When you are self-employed and have a home-office, there is a thin line between “working” and “being jobless”. Then I asked her to type her name in Google. For the next half-an hour she was engrossed finding out more about herself and her namesakes from Internet. Whether you like it or not personal brand matters. During my workshop on technical leadership, we have a session where each participant reflects for some time and then writes what she believes is an apt representation of her personal brand. Here are a few samples from the last workshop. In case you are serious about personal branding, check out 3-step process given by Jan Marie Dore: Three Keys to Developing a Personal Brand. The steps are: (1) Identifying a clear, unique strength, talent or expertise (2) Identifying a message that communicates that uniqueness (3) Persistently communicating the message through various channels. You may also want to check out my earlier article: Winning the boxing game: Art of personal branding. Historic deal: Bharti outsourced its entire IT to IBM in 2004 in a historic end-to-end IT infrastructure transformation deal worth $750-million over 10 years. Today, at the half-way tenure mark (five-years), the deal has touched $2.5 billion. This isn’t surprising considering Bharti had about 10 million mobile subscribers in 2004 while today Bharti’s subscriber base has reached 94 million (growing at a rate of 3 million per month) and the business model involves revenue sharing. Riding on the success of this deal, IBM also signed similar contracts with Vodafone, Idea Cellular and Malaysia’s Maxis. Why does a company like Bharti outsource a critical function like IT? And what did it mean to IBM to prepare for such a deal? Let’s look at these questions below. SM: We are growing at near enough 100 percent a year. And we will be a 25 million customer company in the next couple of years. And we believe that we need to manage this growth and that's the biggest challenge in front of us. JM: That leads to us really requiring a partner who has a very grand vision on where communications and computing is headed, and who can help us implement the right kind of technologies for the right kind of services to our customers. JM: So we needed somebody who came to us not just for cost reduction or giving us a component technology, but somebody who understood our business, understood what the business processes could change into, and come along with us and be very flexible and adaptive in terms of what needs to be delivered to take us to where we need to go to. AG: I think the only big vendor or partner I could look for all across, including with Wipro and Infosys (I have a great respect for them) was IBM. At the same time, you are telling yourself: “I can do all that and still make a profit”. It meant betting on following (1) Willingness to use your balance sheet. There is no such a thing as a toe in the water. When you take this plunge, it’s full-body immersion. (2) It’s a bet on your ability to drive economies of scale – to consolidate lots of data centers into megaplexes or the ability to do with 750 people what two or three customers once did with 1000. (3) It means we could build recruitment, training, compensation and HR processes. And finally (4) we had to learn how to be disciplined – how to negotiate profitable contracts, price our skills, assess risk, and walk away from bad contracts. I would this deal to be a role model for level-5 in PMM. 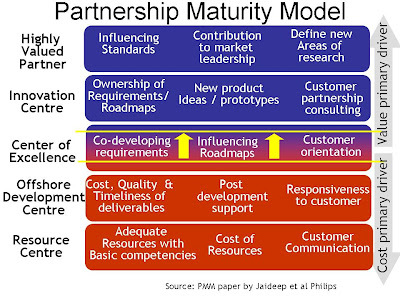 Partnership Maturity Model (PMM) was presented by Dr. Bob Hoekstra, then CEO of Philips Innovation Center in 2004. One can see the influence of the prevalent model CMM on the number of levels (5) and the nomenclature (PMM vs CMM). Nevertheless, I feel it is a useful tool in setting strategic direction for technology captives and ODC centers part of IT services firms. We used the PMM in our research on technology captives in India. 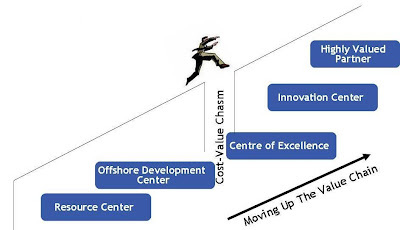 Level-2 (Offshore Development Center): Manage a project independently and deliver on time, with quality and on budget for a given specification. Anyone familiar with Indian IT industry would be able to relate to the first two levels of PMM. The real challenge lies in maturing at level-3. My friend Ramprasad who is the MD of BridgeCo India has used PMM to set vision for his center. While articulating a key challenge influencing roadmap (level-3), RamP says, “The market (Internet Radio) is in the developed world. If we have to influence and then own roadmaps, we need to figure out a way to remain on top of the market dynamics, sitting in Bangalore”. During our research we observed that RamP’s challenge is not unique. In fact, we observed that there is a chasm at level-3 as shown in the figure below. By adopting newer approaches of managing efficiency like CMMI, Six sigma, SCRUM, firms are not getting any better at creating value. I also used Niagara Falls metaphor to explain the cost-value chasm here. Own a framework / platform roadmap: This is perhaps the easiest of the three approaches. Many IDCs have substantial ownership of (mostly software) frameworks / platforms including test automation frameworks. Customers for these platforms are product teams (mostly internal). The centers can influence / own roadmaps of these frameworks. As I work with different clients, I see this either happening already or firms taking steps towards this direction. Partner with BPO: What started as a different kind of business (call-center) has suddenly become a critical asset in gaining deep insights about the customer. Technology center in partnership with BPO can identify opportunities & propose solutions to create substantial customer value. For example, Progeon (BPO) was started as a subsidiary company of Infosys in 2002 with $20 funding from Citicorp. Infosys brought Progeon into its fold by buying Citicorp’s 23% stake in 2006. 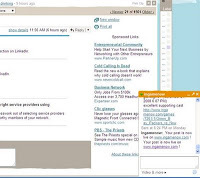 In 2008, Infosys introduced platform based BPO solution for procure-to-pay services as part of a systematic effort to create non-linearity in its business model. Start with local market: A few India centers like GE Healthcare and Adobe are contributing to creating products specific to India market. For example, GE Healthcare is creating an R&D lab with a simulated hospital work environment and aims to double India revenue in next 3 to 5 years. In case of Adobe, Naresh Gupta MD of Adobe India also holds Adobe’s print and publishing portfolio. e.g. see (or listen to) Naresh’s interview on globalization and emerging markets published in May 2008. In the previous article we looked at 4 types of technical leaders from a functional or responsibility perspective. Many times I am asked whether technical leader should be an individual contributor. In fact, many organizations have “individual contributor” as an essential attribute for people on the tech-ladder. Let’s look at 4 representative technologists (Technical Fellow) from Microsoft and how their roles are structurally different. 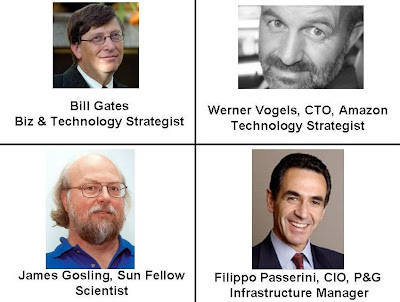 I have made some assumptions based on their profiles available at “Microsoft Big Brains”. It is possible that some of the assumptions could be incorrect. However, I have across technical leaders performing all these types of roles. Individual contributor – part of multiple internal teams: Patrick Dussud is instrumental in developing language runtime architectures for Visual Basic for Applications (VBA), VBscript, Jscript, Microsoft Java and the .Net CLR. He also has designed all of the garbage collectors Microsoft has shipped as part of its dev tools. Dussud prefers working as part of multiple teams, rather than managing people. This is equivalent to being treated as a part-time team member by multiple teams. 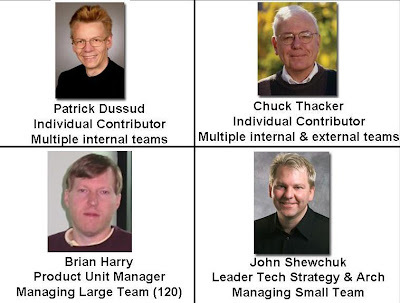 Individual contributor – part of multiple internal and external teams: Chuck Thacker is an individual contributor in Microsoft Research Silicon Valley Lab. Chuck is currently focused on helping build field-programmable gate arrays (FPGAs), which are semiconductors that can be custom-configured after they’re manufactured. Thacker is teaming with other industry and academic researchers on the Research Accelerator for Multiple Processors (RAMP) consortium. One of Thacker’s pet project’s, the BEE3 (Berkeley Emulation Engine version 3) — a four-FPGA system that is used for computer architecture research and is a target for RAMP — is starting to be licensed to academics and businesses so they can prototype all kinds of hardware platforms more cheaply. He also works with Windows and Xbox teams. Manager of a large team: Brian Harry is a Technical Fellow and also a Product Unit Manager running a 120-strong unit focused on Team Foundation Server. Brian has played a major role in getting the .Net Framework effort started. I am assuming Gary Flake who is the Director of Live Labs also manages a large team as he says the lab has 40 active projects with some teams being as large as 20 people. Manager of a small team: John Shewchuk currently leads the Connected Systems Division technical strategy and architecture teams for .Net Services and other Azure services components (Note: My assumption is that a strategy and architecture team may have at max a few tens of people and not hundreds). This shows that technical leaders work under different kind of structures. 1. Business and technology strategist (Bill Gates): Bill Gates demonstrated an uncanny ability to device a business strategy and a technology strategy for winning the PC software game. He had deep product understanding especially the core products. And he played a crucial role in forming strategic partnerships like Intel. Bill used to take week off twice a year (called “Think Week”) and go into seclusion to ponder over Microsoft strategy, read hundred odd papers and write memos to team on strategic direction. This isn’t the most commonly found role in large organizations. Typically you will have a separate person taking care of business strategy and technology. However, it is a typical role in technology start-ups. 2. Technology strategist (Werner Vogels, CTO, Amazon): Vogels has helped Amazon grow from an online retailer (albeit one of the largest, with more than 55 million active customer accounts) into a platform on which more than 1 million active retail partners worldwide do business. Werner says, “Growth is core to Amazon.com's business strategy, and that has had a significant impact on the way we use technology. A large part of Amazon.com's technology evolution has been driven to enable this continuing growth, to be ultra-scalable while maintaining availability and performance.” For a technology strategist to succeed, he needs to partner with a business strategist. I am assuming, at Amazon, Jeff Bezos and Werner Vogels form a good partnership. Another such successful partnership that comes to mind is between Steve Jobs and Steve Wozniak of Apple during Apple-I and Apple-II days. 3. Scientist (James Gosling, VP and Sun Fellow): James did the original design of the Java programming language and implemented its original compiler and virtual machine. He has recently been a contributor to the Real-Time Specification for Java. He is currently a researcher at Sun labs where his primary interest is software development tools. While James has built a technology (Java) that has had a significant impact on the technology world, it hasn’t helped Sun create a competitive position. This is where scientist role differs from the previous two strategist roles. Both roles are essential. However, in a for-profit world, only large and profitable corporations can afford scientist roles. 4. Infrastructure manager (Filippo Passerini, CIO, Proctor & Gamble): For an FMCG company like P&G core, technology would involve areas such as chemicals, fabric, biotechnology, healthcare. However, you still need someone who enables smooth information flow within the organization and with customers and partners by making right technology choices and deploying them. For example, collaboration is Passerini’s particular passion. That's reflected in his latest project: rolling out 48 of Cisco Systems' super-high-end Telepresence teleconferencing systems over the next nine months. Passerini says this is the most aggressive use of the technology to date and serves as "an example of how to bring collaboration to the next level." Note that these roles are applicable in a business unit context as well. See a related view on this topic: Role of the CTO – Four models of success by Tom Berray and Raj Sampath.